Use our dyno service for carburated or fuel injected motorcycles. 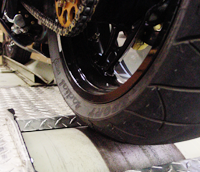 Have your Sportbike, Cruiser or Harley dyno tuned "while you watch". Whether it's equipped with a Power Commander, Screaming Eagle Race Tuner, Super Tuner, Bazzaz or any other tuning device, we tune it right!